Many residential care settings for older people have been established on a culture of rehabilitation. However, this is changing. In many Western countries, recent policy is encouraging frail older people to stay longer in their own homes before going into 24-h care. As a result, on admission to these settings, older people are often considerably more dependent and frail than 10 years ago. The palliative care needs of frail older people with multiple comorbidities admitted to residential care settings are significant. Palliative care is core to their work; such settings are now being compared to the former hospices that founded the hospice movement some 50 years ago. Hospices have an important role to play in reaching out to staff in residential care settings and the frail older people they care for in order to support and enhance a palliative care approach. This chapter describes some of the differences between palliative care for people with advanced cancer (often dying in mid-life) and those dying as a frail older person at the end of their lives with multiple comorbidities. It highlights a number of different quality improvement initiatives through which staff in residential care settings can be supported to adopt a greater palliative care approach. Currently, nearly a quarter of the population in the UK, in Canada, and the USA die in care homes. In other countries, such as The Netherlands and Norway where there is greater on-site healthcare provision including physicians, it is nearer 50% of the country’s population. Alzheimer’s Society. Low expectations. Attitudes on choice, care and community for people with dementia in care homes. 2013. Available at https://www.alzheimers.org.uk/download/downloads/id/1705_alzheimers_society_low_expectations_executive_summary.pdf. Accessed 7 July 2017. Froggatt K, Arrue B, Edwards M, Finne-Soveri H, Morbey H, Payne S, Szczerbinska K, van den Noortgate, N, van den Block L. Palliative care systems and current practices in long term care facilities in Europe. 2017b. Available from http://www.eapcnet.eu/Portals/0/Policy/EU%20sup_proj_/PACE/EAPC_PACE_WP1_Deliverable_January_26_2017_final_amended%20typos.pdf. Accessed 5 May 2017. IAHPC. Definition of palliative care. 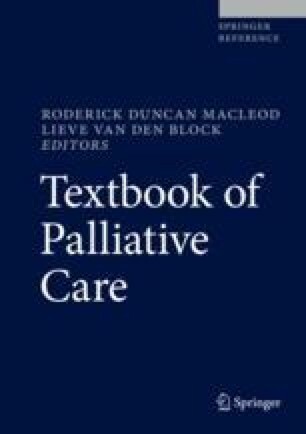 International Association of Hospice and Palliative Care Manual on Palliative Care; 2017. https://hospicecare.com/resources/publications/getting-started/5-what-is-palliative-care. Accessed 17 June 2017, Houston, Texas: USA. Parker D. National rollout of the palliative approach toolkit for residential aged care facilities supporting residential aged care facility management and staff to deliver high quality palliative care for residents. 2013. Available from https://www.caresearch.com.au/Caresearch/portals/0/documents/whatispalliativecare/pa-toolkit/1-pa_toolkit_brochure-dl_websafe.pdf. Accessed 11 June 2017. Smets T, Onwuteaka-Philipsen B, Miranda R, Pivodic L, Tanghe M et al. Integrating palliative care in long-term care facilities across Europe (PAC): protocol of a cluster randomized controlled trial of the ‘PACE Steps to Success’ intervention in seven countries. BMC Palliative Care. 2018;17(47). Open Access https://doi.org/10.1186/s12904-018-0297-1. Stacpoole M, Thompsell A, Hockley J. Toolkit for implementing the Namaste care programme for people with advanced dementia living in care homes. 2016. Available from http://www.stchristophers.org.uk/wp-content/uploads/2016/03/Namaste-Care-Programme-Toolkit-06.04.2016.pdf. Accessed 13 June 2017. Thomas K. The GSF prognostic indicator. The Gold Standards Framework Centre in End of Life Care CIC. UK: The Royal College of General Practitioners; 2011. http://www.goldstandardsframework.org.uk/cd-content/uploads/files/General%20Files/Prognostic%20Indicator%20Guidance%20October%202011.pdf. Accessed 24 June 2017. Thomas K. Summary of evidence: Gold Standards Framework in Care Homes (GSFCH) training programme. 2016. Available from http://www.goldstandardsframework.org.uk/cd-content/uploads/files/GSF%20Care%20Home%20Evidence%20Summary%20Updated%20Oct%202016%20MSR%281%29.pdf. Accessed 11 June 2017. Torvik K, Kaasa S, Kirkevold O, Saltvedt I, Holen J, Fayers P, Rustoen T. Validation of Doloplus-2 among nonverbal nursing home patients – an evaluation of Doloplus-2 in a clinical setting. BMC Geriatr. 2010;10(9). https://doi.org/10.1186/1471-2318-10-9. Accessed 17 June 2017. UNFPA. Ageing in the twenty-first century: a celebration and a challenge. New York: United Nations Population Fund; 2012. http://www.unfpa.org/sites/default/files/pub-pdf/Ageing%20report.pdf. Accessed 17 June 2017.